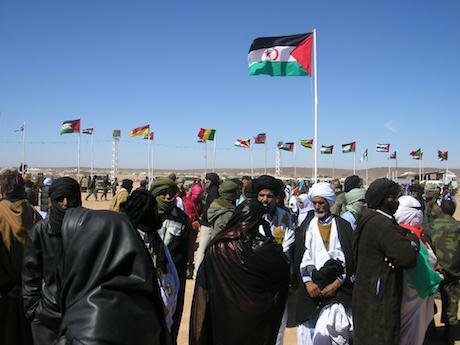 Commemoration of the Saharawi Republic’s 30th anniversary in liberated territories of Western Sahara. Picture by Jaysen Naidoo. Flickr. Some rights reserved (CC BY-SA 2.0). In order to better understand the negotiations between the Kingdom of Morocco and the Frente Polisario (Popular Front for the Liberation of the Saguia el Hamra and the Rio de Oro), it is paramount to bear in mind the principals of international law. Since the ceasefire of 1991 and the implementation of the United Nations Mission for the Referendum in Western Sahara (MINURSO), the negotiations between the two conflicting parties to reach an agreement that respects Western Saharan people’s self-determination have almost become a waste of time. Since 1991, the settlement agreement has just been an instrument of war by other means, where no one cedes their original positions, namely, the independence for Polisario and the autonomy for Morocco. Worse, this situation of stagnation of ‘no war, no peace’ encourages the United Nations Security Council (UNSC) to adopt a new way of negotiation by introducing Special Envoys in order to find a solution that respects the initial plan for peace. However, this approach has no chance of success since the envoy in charge of the mission has been the object of demonization from both parties when they feel that their requests and demands are not received. However, such a situation usually works more in favor of Polisario than Morocco, since the UNSC resolutions uphold the right for self determination. Since the beginning of the conflict, numerous envoys and mediators have attempted to broker an asymmetric power sharing compromise, leaving behind the initial agreement but taking into account the interests of Morocco to implement a kind of autonomy of the territory under its sovereignty. Such a compromise is designed as a geopolitical solution ignoring international laws and resolutions. Christopher Ross seems to be the only envoy who wants to endorse and apply the initial agreement for self determination by holding a referendum directly without any transitional period. The question of Western Sahara falls within a conflict of interests between the USA, France, Russia, Spain and the United Kingdom. Their differences mean that cooperation between the vetoing states in the Security Council is necessary in order to find a final agreement. What I call the containment approach aims to contain the Polisario through interminable negotiations. In other words it is an approach that counts on delaying until the Polisario changes its position to one more favorable to Moroccan interests. This gives Morocco more weight and flexibility to maneuver. Indeed, Morocco has gained more time to exploit the natural resources of Western Sahara such as fish and phosphates. The fishing industry provides jobs to more than 70 000 people, accounting for 17% of the GDP of the Western Sahara territory. As for phosphates, this accounts for 20% of Morocco’s annual budget. Additionally, the agriculture sectors as well as the eolian or solar energy are also increasingly contributing to the Moroccan economy. France, Spain and some other states of the European Union further benefit from the extraction of Western Sahara natural resources. In this regard, many foreign companies such as Kosmos energy, Teredo oil, the French agricultural company Azura, German Siemens and others benefit from contracts against all international laws related to the extraction of natural resources in the occupied Western Sahara territory. In this case, a new balance of power would be drawn by the status quo of ‘no peace, no war’ and Morocco will be in a comfortable situation pursuing its policy of exploiting natural resources and installing Moroccan settlers from the north of the country. To do so, Morocco can rely on an efficient lobbying network. This politics of balance of power system has the virtues of flexibility and moderation but it is subordinate to the requirement of an order defined as the equilibrium between both parties. While the major goal of this new system of negotiation is to prevent the war in order to avoid any destruction of the containment order. This strategy of containment would enable the USA and France to submit Morocco and Polisario to severe constraints, which may respect the formal independence of the parties in negotiation, but often restrict their external freedom of action and interfere in the negotiations. The three UN Special Envoys, James Baker, Peter van Walsum and Christopher Ross represent this strategy of containment. James Backer (1997- 2004) suggested a new framework for an agreement based on an autonomous period of five years under Moroccan sovereignty which would then lead to a referendum. He tried to introduce the American view which suggests sharing first then the option of referendum using federalism or the case of Puerto Rico, a self-governing stateassociated to the United States as reference. Christopher Ross (2009-present) followed the same plan and logic, pushing both actors to find a solution which would have respected Baker’s American model and plan. Peter van Walsum (2005-2008), backed by France and the European Union (EU) supported Morocco’s unilateralist approach without any consideration for international laws of self determination. During a briefing before the UNSC in April 2008, van Walsum said that Western Sahara independence was unrealistic and the UNSC should therefore say so. To ensure that a new Western Sahara state is viable, it must not be a threat to French interests in the region. French troops are permanently stationed in several neighboring African states, such as for instance Mali. In this postcolonial era, North-West Africa is regarded as a region where France’s interests must have the priority over any other foreign country. Indeed, France is weary of any other influence in this region. Yet, if North-West Africa is a Francophone region, culturally and linguistically, Western Sahara is on the contrary largely Spanish speaking. France, the USA, Russia, Spain and the UK are responsible for this stalemate as they view it from a geopolitical angle, largely ignoring international laws, and thus maintaining the status quo of ‘no war no peace’. Morocco’s new strategy to join the African Union pushed Rabat to build a new road in the El Guergarate buffer zone region leading to Mauritania which would also be a road to sub Saharan Africa. Morocco’s decision created even more tension leading to a new escalation with the Polisario, which refused this Moroccan fait accompli. For months, Moroccan and Polisario military forces faced each other until Rabat decided to withdraw under UN pressure. This latest episode however clearly indicates that a new conflicting dynamic is on the table. By attempting to build this road, Morocco miscalculated and underestimated the Polisario strategy and strength. The later demonstrated to the UN that it has the military forces to guarantee stability and supervise the border with Mauritania. The Polisario have recently won some judicial battles such as the December 2016 Court of Justice of the European Union (CJEU) ruling stipulating that any economic agreement between Morocco and the EU does not include Western Sahara territory. This ruling is not only a blow to Morocco’s ambitions and economic relations with the EU, but also limits European interests in Western Sahara until a durable solution is found to keep peace and stability in North-West Africa. Demonizing and refusing to recognize the Saharawi Arab Democratic Republic (SADR) as a full member of the African Union (AU), will not create a climate of trust. Morocco should therefore examine in greater details the needs and aspirations of the SADR. Instead, Morocco has been spending its efforts not only to delegitimize the SADR but also “to present the question of Western Sahara as a bilateral dispute question between Morocco and Algeria. However and as the American scholar Jacob Mundy explains, “Algeria did not create Western Saharan nationalism generally nor Polisario specifically”. On the other hand, the SADR perceives Morocco as a colonial state breaking international laws. The lack of trust in the UN to fulfil its obligations to facilitate self determination for Western Sahara could push Polisario to choose other alternatives for a lasting solution. Polisario saw the annexation of El Guergarate as an ‘outrage’ against the principles of the ceasefire agreement of 1991. It also warned Morocco about the disadvantages of such a strategy. For Polisario, Rabat’s decision can only be explained by its inability to convince the international community of its position over Western Sahara but also by its national economic difficulties. For France, the gravity of the situation also indicates that not only perceptible changes are taking place there but that the changing international situation with the new American president and Brexit could well be a further challenge for the UNSC to maintain peace and a cease fire in Western Sahara. Western Sahara has become more vital to the American global strategy and presence in Africa. In these circumstances, the war of interests will soon trigger a geopolitical confrontation between France and the USA if a positive cooperation to resolve the last colony in Africa is not put in place. Due to the weakness of the Polisario, negotiations between the two parties have been imbalanced.Theyhave not been able to gain the full support of the UNSC permanent members. As a result, the Polisario will continue to face a dilemma between taking up arms or maintaining the cycle of negotiations without real hope of finding a lasting solution. France is against the idea of an independent Western Sahara and will continue to veto any UN resolution that would go against its interests and those of its Moroccan ally. Furthermore, the future of the settlement agreements depends on the strategy of the new American administration as well as the next French President to be elected in May 2017. As a result, the prospects for peace may be further clouded by disagreement between the USA and France as well as the lack of laws for international negotiation.